And may you be in Heaven a full half hour before the Devil knows you're dead. If you're lucky enough to be Irish, then you're lucky enough. There is not a tree in heaven higher than the tree of patience. The Devil invented whiskey to make the Irish poor. Man is incomplete until he marries. After that, he is finished. Bless your little Irish heart and every other Irish part. Marriages are all happy. It's having breakfast together that causes all the trouble. A customer recently asked us to print a quote by Dan Millman, that goes, "Act happy, feel happy, be happy, without a reason in the world." We soon discovered this quote was just the tip of the iceberg. Millman is a former world champion gymnast and renowned coach, professor and author of 14 books including Way of the Peaceful Warrior (adapted to film in 2006 - see Peaceful Warrior starring Nick Nolte). His books are printed in 29 languages and have influenced millions, including leaders in the fields of health, psychology, education, business, politics, sports, entertainment and the arts. So we were more than happy to make this quote available to the Dan Millman fan who requested it. We emailed Mr. Millman at his website, www.peacefulwarrior.com, for consent to use his name with his quote. We were very gratified to receive Dan's approval to carry not only the one requested quote, but nine others of our choosing from his book, Wisdom of the Peaceful Warrior. It's also worth noting that less than 24 hours after adding the "Act happy" quote to our library, the quote was picked out and cited as a favorite by a reader of Momma Told Me, a blog now running a Quote Palettes give-away contest through March 26. What good fortune that it was here for that reader to find, just in time! 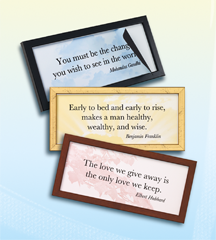 We'd love to hear what you think of the quotes below - do you have a favorite? No doubt there are many more Dan Millman quotes worthy of a place on your wall. Let us know which ones we should be adding over time. And finally, many thanks to Dan Millman for his generous, personal contribution to QuotePalettes.com. The quote reminded me of Burke's famous words, "The only thing necessary for the triumph of evil is for good men to do nothing." But there was something different about J.L. Brown's words, "It is only by our good qualities RIGHTLY SET FORTH that we are to succeed in the future..." Whereas Burke warned against passivism, J.L. Brown was saying something more. To J.L. Brown, the future of mankind would depend not only on our being courageous, imaginative, loyal and diligent (examples of some of our "good qualities"), but also on our ability to use those qualities wisely - in the interests of fairness, justice, charity. We've heard this concept discussed in the context of science and technology and global politics. But none of the hundreds of quotes in our collection expressed this idea so eloquently. And so, I am very pleased that one of the unintended consequences of Lionel Richie's research was the discovery of this quote, which we will proudly attribute to the singer's great grandfather and only hope he receives the credit for generations to come.